Can you reclaim this place? Or will it be lost to Chaos and the Void forever? You are not the first Gods this universe has seen, but those that came before you...mismanaged the place. All around are ruins of civilizations, planets shattered to pieces, and not a thing of life. Only fragments of records remain, scratches in languages so old, that even you cannot know them. The stars are all but dead. But, there is a single star, near the still-warm heart of this corpse of a galaxy, devoid of planets. Perhaps here, you might rekindle this place. Ultimus: The last Main Sequence star in a dying galaxy. A sole survivor of a world abused by gods who have long since turned to dust. It has no celestial bodies orbiting it. Liquidium: The first of the planets, now home to a single moon, and teeming basic life, from plants to bugs to fish and birds to redwoods alike, and the Wuud are thriving here. Potentia: Mostly barren, except for the basic ecosystems which have evolved here. The Wuud: Just starting to use tools. Mostly sedentary, living a single Living Forest, with the eldest at the center. Other Life: Thriving, but not yet subject to boom and bust. They live and they die, but populations grow with each passing day. Discovery: Lots of ruins to discover, but no one to do it. Conflict: No real conflict, just survival. Xythis flutters in and begins circling the dying star. All the while he surveys the universe. Lavernus strolls through a tear of space, looking in despair around him at the ruins of former life. He sighs heavily and looks to his...elder brother, it seems. "A lot of work ahead of us, then." From the depths beyond space and time a shape slides into the universe, its great bulk moving without wings or apparent effort, tentacles drifting in the steller void. C'thon looks upon this ravaged universe and revels in the death and destruction of the former gods dreams and yet. This... is boring, there needs to be a change made here, something to get the game moving again. And so the godcreature drifts through the shatter universe, now picking up a wake of broken planet dust and the tears of dead races, steller fragments and the cast off artifacts of long dead civilizations. Coming upon the last pulsing star near the corpse heart of existence C'thon finally bursts into motion. A twist here, a flourish there, and look it all comes together. And so the discarded debris of the dead old order are changed into the base for something new. And behold a planet comes together from the mass of debris picked up by the divine monster. A storm wracked realm of great vast oceans bounded by raging volcanic island chains, a single large continent stands out on the surface but even this is wracked by tectonic shifts and the pains of a newly crafted thing. Yet the world is barren for C'thon does not make life, he only changes it as he desires. So satisfied C'thon descends into the boiling depths to bide until things become interesting once more. Xythis chatters back at him with innumerable voices. "Is it really? Shouldn't be too hard I think." Seeing what his counterpart has wrought, Verdant shifts. His mass of plant-like matter forms a wry smile, and he touches down upon the surface of the planet, examining Liquidium's continent and its mass. "Liquidium, is it?" the plant-man rumbles. "Let there be more than just cracked rock and the baking sun, then." He plunges his hand into the earth, and his roots spread. Soon, grass sprouts, and small, monocellular and simplistic organisms begin to feed and thrive in the pools and crevices. Verdant looks at this, and his smile widens. "Let Liquidium be barren no more. The seed of life is planted. Now, it must be nurtured." And so, Verdant sat on a rock, placed what passed for his chin in his gnarled mass of roots of a hand, and sank deep into the mire of thought, as the new trees, with their flat blue leaves, and the tall, silky-soft grass rose up around him. Lavernus blinks at the roiling mass that is C'thon and sighs. "Yes, elder brother, it will take quite a bit of work. So saying, he focuses elsewhere in the orbit of the star, pulling and generating the matter of creation to craft a smaller, more refined world. He shapes it pleasantly, ensuring it has the proper atmosphere to support oxygen life. He sets the continents upon it evenly and with care, ensuring the seas can shift in current around them. His sole conceit is a large perfectly circular landmass in the middle of the ocean. "I name you Potentia, for all you will bring." He pauses, looking to his 'younger brother' Verdant. "Erm, Verdant, if you might...?" Verdant stretched to his feet, looking at his older and more eloquent brother. With a grunt, he reached into the earth, grabbing a massive fistful of seeds, and looking straight in the direction of this new planet, blew. The Wild power of his breath scattered the seeds and they changed, as Life always does, taking hold in the sea and becoming plankton, algae, and krill that eventually crawled onto the land as moss and lichen. Verdant, having begun the seeds of life on Potentia, looked around and saw that the planet Liquidium was...unfinished. It was wild, and the plants were tall and strong. Emerging from beneath the mud of the mangrove swamp he'd been ruminating in, he thought for another moment, and walked the world, examining all his children, every flower and blade of grass. Finally, he stopped, in a place that struck his very core - a clearing, in the middle of a large forest, with trees as tall as any being could wonder. He saw these trees, and knew that there was power here. The power of the Wild, and of the life that must be brought forth. A world only means something while there are beings in it that can appreciate its majesty, after all. And so, Verdant breathed into the trees, placing his Essence into them, and allowing his roots to meld with theirs. He reached out, grasped the life at their cores, and...changed it. Life does, after all, find a way. And he bequeathed upon these special trees three key things - movement, communication, and sentience. They would become the Wuud, the first true Life, able to see and appreciate the world in their ways, and to become families and cultures under the guidance of his brothers. He ruminated once more, thinking about the many tasks left at hand, as he idly spoke. "Vernus," the swampy deity said. "I made these lives. They need shaped." And just like that, Verdant was off, sinking into the swamps again to dream his lively dreams. Xythis alights onto Liquidium and preens his feathers. "Still rather desolate I think. Needs a bit more activity." He takes a quick flight around the planet, shedding feathers as he goes. Each one that touches the ground turns into a new creature but one of Xythis' design. Not one is what it appears to be, that is, each one is a mimic of another species. The new species run the gamut of sizes with a maddening amount of variety born in a moment. It's all dreadfully confusing but demands a creature be clever if it wants to prey on living things. "There, that should start things up nicely." Xythis then flocks to some nearby piece of large space rubble. "Going to build a nest next, somewhere to put my feet up as it were. Here's good spot, I think. A nice divine temple orbiting the sun. It'd really give the mortals something to strive for." Lavernus studies the tree-folk, noting the building blocks of intelligence his primal brother has given them. He smiles and begins to mold his art. He instills patience and a tribal aspect, that they might band together and help one another. After, he settles back to watch over his own pet project. "I do hope the changes help them, little brother." Another descends into the debris of this godless realm, bemused as he sees the ruins of civilizations gone by - he'd intended to start anew, but this was an interesting discovery indeed. But before he could begin to record, he realized he was not alone, floating toward the single mote where his bretheren were already beginning the work of building anew. Very well, he would assist in this endeavor. Loosing his cloak and opening his tome to just the right page, he drops a single blot of ink that pauses before it ruins its page. Reaching across the cosmos, he picks carefully around the ruins and artifacts, cautious to preserve the testament of the failures of his forebears. Only through knowledge could they avoid repeating mistakes of this waning universe, and make it wax once more. Only once he's gathered enough of the stuff of cosmos does he close his hands over the ball of dust, compressing it until it heats, then cools. Not a planet, but a moon, which he sets in motion around this planet of 'Liquidium'. "I am Coevus, the Keeper of the Book. And it seems I'm rather late to arrive. Well then, now that's out of the way, perhaps one of you would help me set up the canvas to shield this mess from mortal eyes. At least until we figure out what this all is." Gesturing behind himself to the ruined cosmos, he again adjusts his cloak, then casts it around the edges of their little infant universe, born from the old. And yet, it doesn't quite fit right, just a little gap peeking through. Suitably embarassed, but holding the ends closed on his end, he looks to his new bretheren. "Er, could someone get that?" "Oh, hello there! Hmm, you've a point. I'd venture to say it's not quite necessary yet? We've not even gotten the little ones thinking yet, much less wondering at the stars!" Lavernus laughs slightly, patting Coevus' shoulder reassuringly. "Perhaps, although once they get clever enough, they can in fact look back this far. Speaking from experience." "It seems like i'm not the only one who was sidetracked then, good." said a voice out of the grasping dark. A large bell chimes through the space around them to signal a coming ship, but all that comes is Endring himself. Walking down to Liquidium and examining it shows disappointment on the god of piracy face. "i'm not seein' a lot in da way of 'aquatic life' how about I get this going the right way." After his observation, endring pulls up his coat sleeves and grabs some of the plantlike and living creatures already there and grinds them in his hands and throws the new contents into the worlds oceans into the sea below, breathing life below the surface in equal with the one above two-fold. Through the narrow space of the veil, it seems Coevus is the first to return to waking, having spent his time cataloguing the ruins. Though they stymied his comprehension for now, it was only a matter of time. The cloaked figure frowned, upon seeing the state of his work, and muttered largely to himself. "Perhaps not quite as planned. And yet, perhaps better than I'd have hoped." Looking for his peers and seeing that he is the first to awaken once more, he cracks his fingers and prepares once more, writing His decree. "For those mortals who dare to know, I, Coevus, grant thee a boon. No longer shall this be a Veil, but a tapestry, for the history of your peoples to be recorded forevermore, and for those who seek it to reach out and grab the Threads of Fate. May kings move mountains, Heroes and Villains all, and both clever and bold shall reap bounty." And with that announcement, he closes his tome with a resounding thrum, as the words burn off the page and into existence, pushing the Veil away once more and fraying it ever so slightly, that the mortals may yet reach for the threads. All magic henceforth will be tied to the Tapestry. 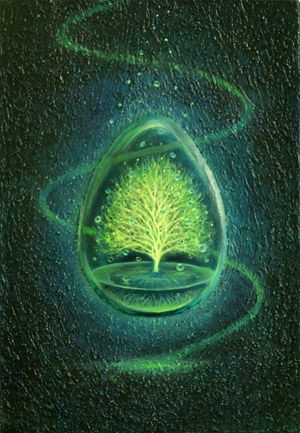 Magic is cast by Weaving the Elemental threads (Stone, Air, Water, Fire, *Life(This includes removing Life) and *Time. The last two are hidden from normal sight, and only granted to those who attain a mastery of this system. Users of Time gain limited ability to look to the past, and augury to the uncertain future (Based on probabilities, only the strongest possibility will be shown.) In addition, those users of the Weave will be Marked by it, graded for aptitude, except for those who are marked for Time. All may learn to use and see the Weave, but only those with a certain threshold of Intellect will have the ability to do so innately. All creatures capable of using the Weave cannot be subverted by Its manipulation, for that is the realm of Gods. And to the Gods, in both Mortal and Divine form, he leaves a seventh thread: Fate. Lavernus claps his hands and begins to get to work, creating a variety of fish and small animals, and making sure to seed some small fruit species along Potentia. Now that the basic fundamental to support higher life exists, He sets to his full craft. A species of omnivorous human-like bipeds, with two arms, 3 fingers and an opposable thumb. He imbues them with a focused level of intelligence, emphasizing tribal instincts, creativity, problem solving and the use of tools. "And now we watch and wait, for the siren song of civilization cannot be denied. Behold, my siblings, the Koari!" It's Coevus' turn to swoop onto Potentia, and as he alights to record this new species, he chuckles and looks over to his Brother. "Someone's impatient, aren't we? I do wonder how they'll respond to fire, both of tool, and of my boon. That's always such fun, the wonder of an infant race." "Aren't they just? I have high hopes for them." Lavernus beams down at Potentia, paternally. Sweeping his gaze across the darkened cosmos, he came to the seam of his Veil, frowning to see that it remained incomplete. "I do hate a job unfinished, and yet, there's so very much to do! Would that these ruins did not stymie me so. Remind me to gift your people a boon when next we meet, for there is another we must first tend to, Lavernus." Grabbing the ends of the fabric incomplete, the far-sighted Coevus sealed his Veil around the old world from Mortal eyes, weaving it anew into his completed Tapestry. Then, to Verdant and his eternal swamp, an echoing call. "Brother of the Wuud, I'm afraid I shall need your aid to bestow a boon upon your children, for my eyes they are the First, and shall be granted a gift as such." Edit: Clarity - The Veil has been completed, and the Old One's failure shall be veiled from mortal eyes and ken until such a time as they're ready to see for themselves. See previous post for details on the Tapestry. C'thon rises from his slumber and looks upon what now is. Tentacles drifting in the waves the divine monster ponders its next move upon the cosmos. Xythis pecks at his asteroid, contemplating a divine palace for the pantheon but otherwise saving up his power. I see the next step, that which lives shall change, and it shall learn to bring death to maintain its life. Behold Mortals, THE DIVINE, and Its power. As the newly remade Treemen dive into their world to experience this new world and survive in it as they may. C'thon fades into mist and darkness leaving the remaining Wuud to spread the knowledge of what has occurred to their brethren. hoarding my remaining 5 acts for now... possibly to waste on make a new living star or something shiny.